Los Angeles – China tightened bank reserves for the fourth time in two months before Friday’s market opening causing the price of gold to slide 1.0 percent to $1,359.20 an ounce as silver prices also slipped 1.0 percent to $28.38 an ounce. The Gold/Silver ratio (GSR), the number of ounces of Silver needed to purchase an ounce of gold, rose to a one-month high on Friday of 47.90, showing silver underperforming gold in a falling market. Legendary investment consultant Harry Schultz, author of the world’s longest-running investment letter, the International Harry Schultz Letter, says gold could hit $2,400. “In my view, money supply, public debt & the budget deficit are in a bubble, not gold, not yet…Wake me up at $2,400 Gold,” Shultz suggests in his most recent and final investment letter. Schultz, at the age of 87, is officially retiring. Schultz leaves us with his final investment allocation recommendation which includes a 25 percent allocation to physical gold bullion. He warns his subscribers to continue to avoid fiat currencies, a position that remains consistent with his forecast for future gold bullion prices and a distrust of paper currencies. Physical gold dealers said gold bullion prices could rise further as demand from jewelers and investors picked up in India and China. 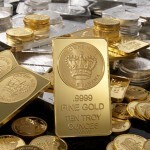 The increase in demand is leading to tighter stocks for gold bars in Singapore and Hong Kong. The Lunar New Year, China’s biggest holiday, begins in less than a month on February 3, and is celebrated for between five and fifteen days. Gold represents wealth and good fortune to the Chinese and remains a very important part of the Chinese holiday.”Demand is high ahead of the Chinese New Year. The jewelry sector is gearing up, and giving Gold bars as a gift has been getting very popular,” said an independent investor in China. This is an appropriate time to remember the words of “Mad Money’s” Cramer last week when he suggested that precious metals investors “take advantage of the weakness if you haven’t already, as we are hardly done with the run. Why? Because the one thing we know about 2011 is that currencies are suspect. Paper is suspect. There’s too much being printed here. There’s too much that’s going to be printed in Europe. The stuff’s worth less and less. That means gold will be worth more and more.” U.S. markets will be closed on Monday in observance of Martin Luther King Jr Day.